Made to fit a foal's head with adjustment on the nose and crown. Rivet construction. This halter has been great! 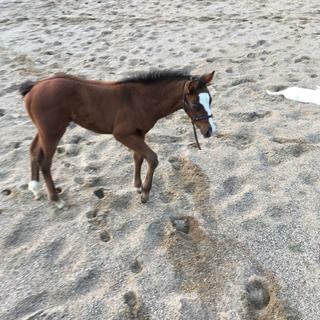 We put it on our three week foal and she is halter trained and leading at 7 weeks now. The only drawback was the metal rivets, although very smooth, will still rub a little spot of hair off their face if you leave it on continuously for more than a few days so best to work on putting on and taking off as soon as possible.The halter itself is a very soft leather and very lightweight.Easier to put on the foal if you rub it on the mare first. Lightweight, adjustable, fairly priced foal halter. Not the strongest material but it's perfect for babies to breakaway who may get hung up or in an emergency. I would highly recommend this halter. I have a week old colt and it is time to put a halter on him. To get an early start on halter braking my foals.